After a $33 Uber ride out of South Lake Tahoe I find myself back on the PCT. That's right, I took an Uber back to the trailhead. For me, it was worth the convenience, I'd already used up most of the daylight in town. A sunset hitch to the national forest likely wasn't going to be easy. In town today I had Tahoe Sports Ltd replace the carbide tips on my trekking poles. They'd been wearing down to stubs these last couple hundred miles. Also, shout out to Base Camp Pizza for giving PCT thruhikers free specialty personal pizzas. The BBQ pizza was fantastic, and went down great with a Mike Hess Grapefruit IPA. I've officially started the Northern California map section of the PCT. 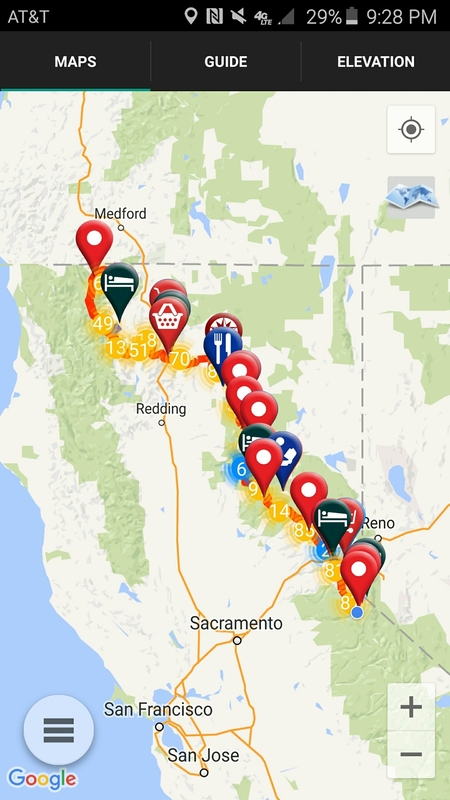 The app I've been using to guide me the entire way, Guthook's PCT, divides the route into Southern California, Sierra Nevada, Northern California, Oregon, and Washington sections. So. Cal and the Sierra sections are now behind me. In another 600 miles that little blue dot in the picture below will be finding its way to Oregon. My next stop is Sierra City, 101 trail miles from where I sleep tonight. Cell service, (I'm hoping), will be better this stretch. I've been meaning to put down my thoughts on Climate Change into Essay #4 (unless Al Gore gets offended and I have to issue Essay #4.5), so stay tuned for that over the next five days or so.